We place a lot of value on tools. Some tools are practical and intended on organizing your work, while other tools are intended to be inspirational. When I started writing The Whisky Cabinet, selecting the right tool (or tools) was important. Much of my previous writing was done on a distraction-free minimalistic writing app called iA Writer. Using iCloud, it syncs between my Mac, iPad, and iPhone. The app gives me a blank canvas without buttons, formatting, or other distractions to worry about. Its seamless syncing means I'm always staring at the same document regardless of what device I'm on. By freeing my thoughts of formatting, saving, and syncing, it provides for an inspirational slate for my writing. With iA Writer, my ideas take shape. Best of all, because OS X and iOS saves every keystroke as its typed, syncing is done seamlessly. I don't need to save the document, close any apps, or otherwise worry. I simply leave the computer, and turn on the app on my iPhone and the document I was working on is there. This was especially great when taking Thor to the dog park since I could continue on with my writing while he froliced with other dogs. When I started writing The Whisky Cabinet, however, iA Writer became an impractical choice. Having the entire book as one flat document seemed crazy to me, especially when I was constantly jumping between sections of the book during writing and editing. I'd start and edit some sections in iA Writer, but all documents eventually went into a fantastic app for long-form writing: Scrivener. Having a system to stay organized helped immensely with a book of this size and detail. The book is broken down into three main sections, with many sub-sections within. In addition, each region (America, Canada, Ireland, Scotland, Japan, and other world whiskies) had its own folder, and each folder had an introduction section and then a list of distilleries I had or planned to review. I used Scrivener's simple flag system to mark sections as being in first draft, revised draft, or final draft. Having the book sectioned into folders and sub-sections, with status flags, meant I easily navigated to the section I felt like writing at that particular time. This removed much of the common challenge writers generally face in meeting with resistance to start writing. If I felt like editing, I'd look for sections that needed proofing. I can't stress enough how helpful it was that Scrivener let me sit down and work immediately. Considering I have a day-job unrelated to writing, managing my time and getting to work on my book quickly was key. Scrivener let me do this. The one feature that Scrivener is missing is the ease of syncing files across systems. 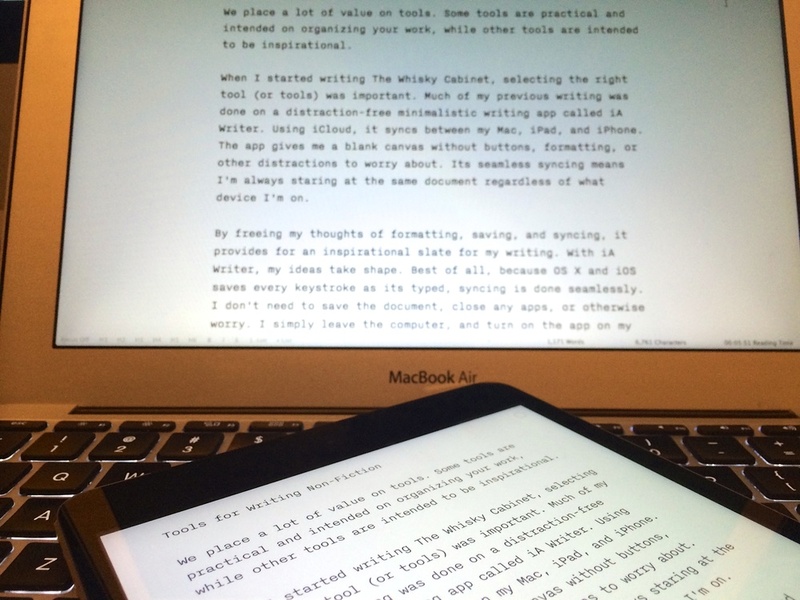 There are ways to sync Scrivener with your iPhone and iPad, but the solution isn't pretty. Syncing between computers is made easy with Dropbox, but only one computer can have the file opened at a time. This meant I was doing some copy & pasting to iA Writer when taking documents on the go. There is, however, an iOS version of Scrivener in the works. Once the book was finished, and I submitted the first draft to the editor, Scrivener was no longer an option. It wasn't a file-format that the publisher worked with. They used Microsoft Word. Scrivener compiles and exports into Word format (and a lot of other formats) nicely, so this step was painless. However, since we were using the change tracking system in Word I could not go back to Scrivener for writing. When you're neck deep on tight deadlines, it matters less how the app feels. Functionality wins out. This is entirely true, but apps can become a distraction. Microsoft Word is one of them. I use Office products on my Mac regularly as part of my day job. I'm used to the cluttered mess that's Microsoft design scheme. Originally, when making the switch away from Scrivener, I avoided using Word by choosing Apple Pages instead. It's an incredible app. It syncs between all Apple devices, the change-tracking review feature is smooth and easy to use, and it's a joy to write within. I worked on the first set of revisions in Pages from my iPad and Mac, depending on where I was. Unfortunately, the exported Word format caused my publisher issues when it came to revision tracking. This isn't a bug I was able to find anywhere online, so perhaps it was just a one-of. Regardless, Pages was no longer going to be an option because the changes were corrupting my publisher's Word file (everything looked fine on my end using Pages and Word). Microsoft Word is an obstacle. The fonts are wrong. The default page zoom is wrong. The buttons get messy. The review feature is functional, but unpleasant to use. For all its time on the market, Microsoft Word should be the far better, easier, and more thought-out product compared to its competition. It isn't. Microsoft Word has the appearance of an app designed by committee, rather than an app designed for writers. It pales in comparison to Pages. I'm sure Word has features that Pages does not, but for my use, none of these features mattered. Microsoft Office cloud syncing is embarrassing on Apple, and far worse compared to Apple's iCloud. Perhaps the Windows version of Office does a better job, but on the Mac the syncing works as a mutated cross between Dropbox and iCloud. It is neither seamless, nor simple. And worst off, I didn't trust it after a few syncing conflicts. The iPad Word app is a step in the right direction, but it offers no credible benefits over Pages. Still, I needed to use Microsoft Word, and as much as I complained, the task of editing the book was finished with Word. I could have written the book entirely in Pages, but with over 200 different sections in this book, I would have been trapped in a linear world. While the same is true for Microsoft Word, the overall clutter of the interface and the messy Cloud solution made it an impractical choice for writing a manuscript. I'm sure many (most?) manuscripts are written in Word. George RR Martin still uses a DOS version of WordStar, and some writers prefer the tactile feel of a type-writer. Anything is possible, but my preference was toward using a platform that efficiently organized my writing. Scrivener became the core application for my writing, with an assist from iA Writer for short writing projects and for writing on-the-go. If you'd like to learn more about whisky, The Whisky Cabinet is available for pre-order.